Dan James, President of Medgold, said: “We’re very pleased to announce the first results from Phase 2 of our drill program. These strongly mineralized drill intersections demonstrate good continuity of the mineralized structure and grade over hundreds of metres, with the mineralization still open to the west. The majority of the mineralization is hosted within an intensely brecciated unit, termed the Triple-X Zone, that occurs at the fault surface which typically yields high-grade gold grades ranging between 5 and 25 g/t Au. The hanging wall rocks are also brecciated and mineralized over apparent thicknesses of up to 100m. We also continue to intersect significant silver grades, from trace up to 1,750 g/t Ag and trace up to 28 % combined Pb and Zn. BAR008: Collared 140m to the west of BAR001 (Discovery Outcrop, see press release 11th June 2018) and BAR013 is collared a further 70m to the west. Both yielded strongly mineralized intersections of Au and Ag mineralization. BAR008 intersected a zone of very high-grade mineralization, yielding 10.35 g/t Au, 235 g/t Ag and 9.57 % Pb+Zn over 5.85m, hosted within the Triple-X zone. BAR009: Collared 70m to the northeast of the Discovery Outcrop on the extreme flanks of the IP-Chargeability anomaly. BAR010: Collared on the same collar as BAR002, but drilled to the east-northeast, it yielded 38.20m at 3.98 g/t Au, 158 g/t Ag and 0.66 % Pb+Zn, including 6.85m at 13.49 g/t Au, 788 g/t Ag and 3.09 % Pb+Zn. The high-grade mineralized intersection in BAR010 is located 35m away from a similar intersection previously reported in BAR002. BAR011 and BAR012b: Located approximately 250m to the northwest of the Discovery Outcrop on the northern flanks on the IP-chargeability anomaly. Strongly mineralized zones within the Triple-X Zone were intersected in both BAR011 and BAR012b yielding 10.75m at 4.76 g/t Au, 33 g/t Ag and 0.67 % Pb+Zn, and 15.20m at 1.68 g/t Au, 10 g/t Ag and 0.49 % Pb+Zn, respectively. * The mineralization is thought to be hosted along sub-horizontal to shallowly dipping structural zones and as such the true thickness of the reported intersections is estimated to vary between 60 and 100% of apparent width. Due to the early stage of exploration and the spacing between current drill holes the company is unable to accurately estimate true widths. ** Coordinates are given in WGS84 datum and UTM zone 34 projection. An updated plan map showing drill collar locations and hole traces, and cross sections is available on Medgold’s website at https://medgoldresources.com/tlamino/. The Tlamino Gold Project (the “Project”) is located in Southern Serbia, close to the borders of both Bulgaria and Macedonia, approximately five hours south of the capital, Belgrade. The Project is comprised of two exploration licences, Donje Tlamino and Surlica-Dukat, each approximately 100km2. All exploration work at the Project is fully-funded by Fortuna, which has an option to earn up to 70% of the Project by spending US $8 million on exploration over five years and completing a Preliminary Economic Assessment (see Medgold news release of March 7, 2017). The Barje Zone is host to a large outcrop of intense brecciation and mineralization, which was identified and channel sampled by Medgold in 2017, yielding a best result of 84m of 5.60 g/t Au and 105 g/t Ag (see Company press release on July 18, 2017), following a period of target generation and desktop studies. Later in 2017, an IP-Resistivity geophysical program undertaken by Medgold at the Barje Zone identified a large chargeability anomaly measuring approximately 1,400m east-west by 500m north-south, as well as a second-order anomaly with a NNE-axis overlying the Barje outcrop. The outcrop channel sampling and geophysical survey results were highly encouraging, and a first phase diamond drilling program was designed to test for the presence of a large shallow mineralized body associated with the Barje outcrop and chargeability anomaly. This drill programme has confirmed this mineralization. Gold-silver mineralization at Barje is associated with tectonic brecciation along a large regional detachment fault which is mostly hosted within the hangingwall schists. This brecciation has structurally prepared large volumes of porous and permeable rocks, suitable to host mineralization. Intense hydrothermal breccias and altered schist clasts typically form at the base of the hangingwall zones in close proximity to the detachment structure. 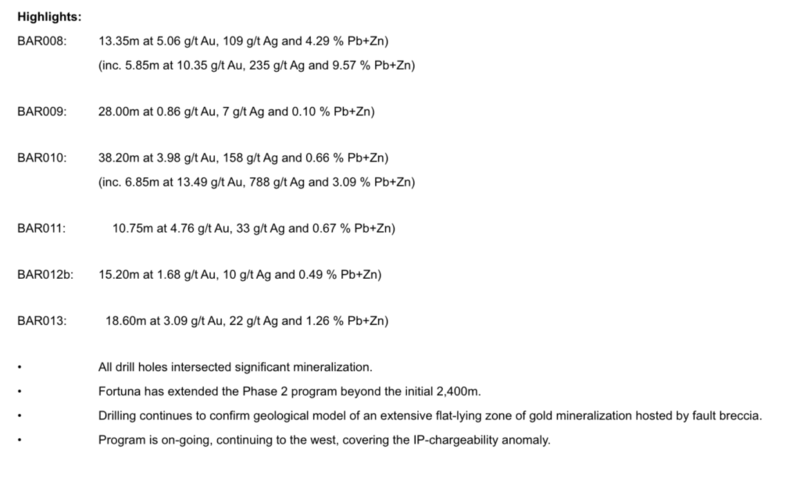 These zones of intense brecciation typically yield high-grade gold-silver intercepts. Brecciation, fracturing and sulphide mineralization is pervasive across large zones of the hanging wall schists and yields broad intersections of low-grade (>0.5 g/t Au) to moderate-grade (>1 g/t Au) gold plus silver mineralization. Drilling is carried out using PQ and HQ size tooling. Drill core is cut in half by Medgold using a rock saw with one half of the core then taken as a sample for analysis. Sample intervals are generally between 50 to 150 cm producing samples of between 2 to 9 kg. Approximately 4% of samples are duplicated by submitting primary and duplicate quarter-core samples. Half-core samples are delivered to the ALS Geochemistry laboratory facilities in Bor, Serbia. The samples are crushed and pulverised using method code PREP-31, are fire assayed for Au using method code Au-ICP21, and are analysed for multi-elements using method code ME-MS61 following a four-acid digestion. Overlimits are analysed using an appropriate method. Medgold routinely inserts multi-element geochemical standards, blanks, and field duplicate samples into the drill core sample stream to monitor laboratory performance.